Happy Monday! 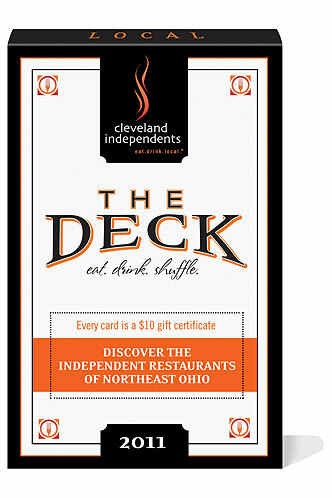 The month of gifting continues and this week you have the chance to win a Cleveland Independents 2011 Deck. The deck consists of 52 cards representing independent Cleveland restaurants. Each card gives you $10 off a $30 purchase. I have a thing about chain restaurants. I grew up in the suburbs and that's practically all I knew. When my husband and I decided to buy a house in Ohio City in the late '90's that all changed. It would take us longer to drive to the big name chain steakhouse when we were surrounded by the best local restaurants in the city. Over the years it just became habit and now I have a hard time passing them up for an Applebee's, Friday's or Outback. There are so many now that I have never even been to. 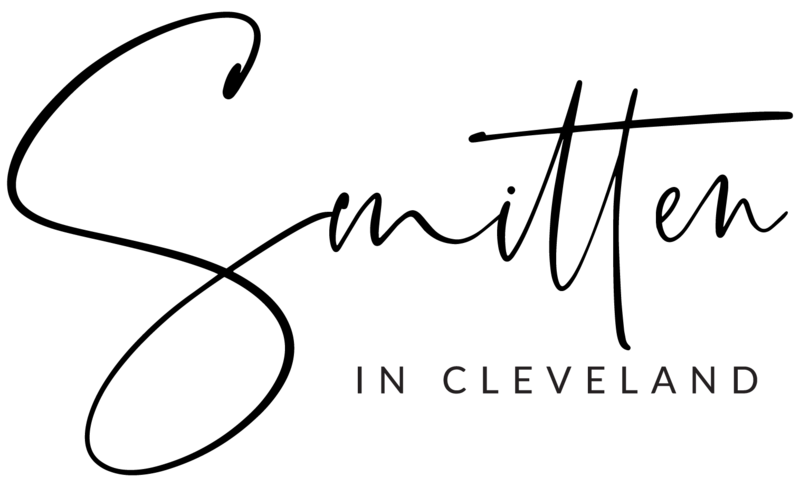 We are so fortunate in Cleveland to have a wonderful dining scene. You can get practically any cuisine and what's better than supporting local businesses and farms? 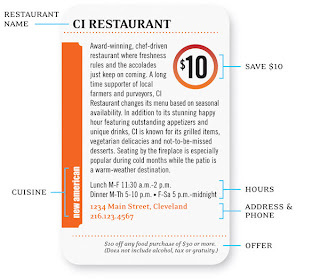 The people over at Cleveland Independents know what they're doing and do it well. They consist of over 80 locally owned and operated restaurants and are committed to nurturing and promoting local businesses. Once a quarter they have their ridiculously fantastic gift certificate sale offering $50 gc's for $35 and $25 for $17.50. These can be used for dine-in or take-out. One year they slipped up and told everyone what time the sale would start, effectively jamming up their server and shutting it down. Their CI gift cards are one of my go to gifts. Available at any one of their member restaurants, it presents as a lovely gift with their little black book directory with details and descriptions of all their members. And they don't expire! Their website also has an event calender listing wine tastings, multi-course menus and other special events. So back to the free stuff! I'm giving away one CI Deck. Included in this year's deck are some of my faves. Flying Fig, Lago, Light Bistro, Luxe and Players. Keep some cards for yourself and give some to friends, they are good throughout 2011. What's your favorite local spot? 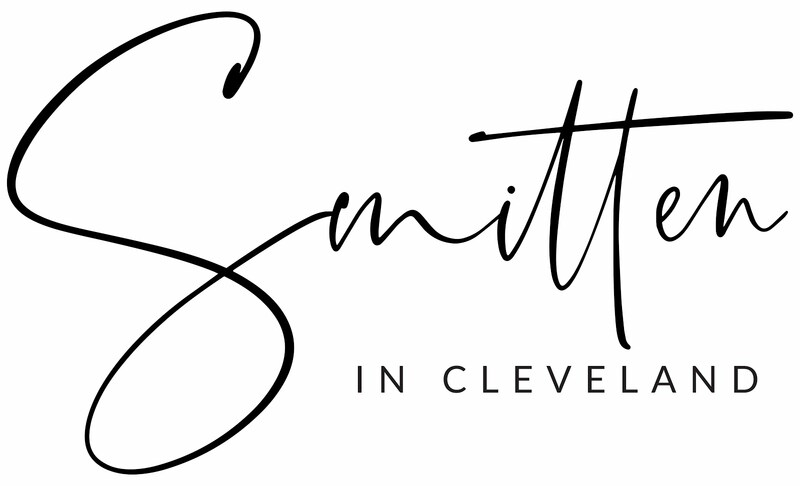 Comment on this post, my facebook page or email me at smittenincle@gmail.com. A winner will be announced Friday morning 3/25. On a side note, I'd like to thank my husband's friend Dave for inviting us to the Lexus event Saturday @ Playhouse Square. Much fun was had, and who doesn't love having 2 dates for the evening?! ﻿The main lobby of the State Theater was transformed into a nightclub featuring interpretive dancers. Absolut was debuting their newest addition, Absolut Wild Tea (black tea & elderflower) and serving specialty cocktails, the Brazilian Cosmo and Peach Exotic. Lexus was unveiling their new CT 200h. A hybrid aimed at a younger clientele starting under $30k. Cocktails and music flowed as DEV and Jay Sean took the stage. Lupe Fiasco was originally scheduled to perform but was unable to attend due to illness. It didn't matter. We partied like a G6 anyway. Here I am getting in to check it all out. The evening was great and filled with the best people watching. You know how it can be at events like this. You will always have those people who dress up as if they're going to prom. It was all I could do not to snap their picture and produce my own Fashion Police! On another side note, (I swear this post is almost DONE!) Lilly Handmade Chocolates is closed til the 25th for renovations. They are taking over the space next door. I can't imagine the shop any better than it already is so I'm quite excited to check it out. I love the Deck! We got one for Christmas and it is the best! (Please don't count my comment as an entry for the giveaway!) Also, got my Birchbox email confirmation yesterday...thanks again and so excited to try all the fun samples! This is awesome. I love Light Bistro, I've been there once and keep meaning to go back. I was visiting a friend in Ohio City over the weekend and we went to Le Petite Triangle Cafe and I fell in love. I mean I couldn't stop talking about how much I enjoyed the place. I'm with you on the chain places, Applebee's = garbage in my mouth. We have been to Deagan's in Lakewood a few times and haven't been disappointed. My husband and I are still huge fans of Amp 150. Odd location, but great food! I am not very savy when it comes to posting things, I hope this makes sense! @Dina-Le petit is the best! Crepes and a pot of french press coffee? yes, please! @why cle?-you're welcome! you will love it. My favorite places are Le Petit Triangle, Fat Cats and Three Birds. The last time I was at Three Birds, they had the most unbelievable pan-seared scallops with mashed potatoes and a corn truffle sauce. Absolute heaven! I was at the Dark Ride too. Fun fun times. Tough question but I would have to say my favorite local spot is The Greenhouse Tavern. Always great food. I love their emphasis on local foods and the "green" lifestyle. I love living in ohio city and would love the deck!! my favorite local spot is market ave. - coffee, beer and wine all one street!! my favorite local spot is anywhere in detroit shoreway - currently it's XYZ the tavern!